Running a WiFi dongle off my Nikon D5200 dSLR and installing Live View controlling apps on both a Windows 10 tablet and a Samsung Galaxy Note has been very successful, so far. It gives me an intervalometer function that the 5200 doesn't natively have and allows both Live View and full camera control on the tablets (or smartphone for that matter), which can be handy for timer shots, animation and macro work. Studio photographers who want to show their work to a client as they shoot it would also have a need. I'm using WiFi Wireless Live View Remote Nikon D810 Df D610 D600 D800 D7100 D7000 D4 D3x with dslrdashboard bundled in at no extra cost. The dslrdashboard would work with other WiFi devices, including Nikon's own WU-1a and the like, but I can only vouch for what I have. (It also suits Canon and some Sony cameras.) You can buy the dashboard alone via the Play Store for a small fee. I'm using Android, of course (and Win 10). The dongle I've bought needs the standard Nikon cable which comes with the camera, by the way, and just hangs loose on the cable, sadly. Whereas the WU-1a plugs straight into the connector on the camera. Other designs are even more convenient, mounting on the flash hot-shoe; but then you have to relocate your flash of course. So far every function works with my combination of hardware, but it won't fully work with Nikon's 3XXX series and perhaps other models. The Nikon D5200, FWIW, is both a bargain and a very good DX or APS-C format dSLR. It works for me, anyway! Sometimes it's easy, other times it's not. Upgrading my old Toshiba L500 to the Anniversary edition of Windows 10 (it's running 1507 right now) hasn't been easy. I lost count of how many times it has made it to 95% and fallen over. (c) resetting Win10 (that failed) and rebooting off a fresh Win10 installation USB (which also failed). I'm no closer to a solution. I did get a glimmer of hope when I logged in under a different account (I have at least 3 on that box) so I'm backing up - again - after a failed backup and will try all of the above again. Oh, and I tried to download and run the update manually, too. It failed. And yes, I was logged in as Admin. And made lots of space. And disconnected anything I didn't need. My other Win 10 boxes - all Lenovos - shamelessly updated effortlessly, by the way. But they are newer, which always helps. What makes a brand worth paying extra for? Or, what's under the hood and does it matter? So you just bought the latest XYZ brand laptop, eh? And you've been an XYZ brand fan since way back, I hear. Well, that's cool. Hope you didn't pay too much extra for that "cool brand" buzz, though. Presumably many of us realise that we have "Intel inside" most of our PCs (or AMD, or whatever), and a host of other known (like NVIDIA) or unknown brands that form an ecosystem of mainboard, graphics, hard drive, I/O and other componentry lurking inside our machines as well. This more-or-less minor brand ecosystem includes what's inside smartphones, notebooks, laptops and almost all popular consumer-grade hardware, of course. Your brand-name hardware is not all made (or even designed, let alone invented) by one company, you know. So much commonality does make you wonder exactly why XYZ brand is considered so "different" and worth the extra bucks, of course. And yet there are differences. Not just in marketing and support, which can be crucial, or in the out-of-box experience for that matter. Some hardware has a greater degree of bespoke design and innovation, and some brands get "first pick" of the best, highest-grade and newest stuff. And you pay for that privilege. Or not. Some shortcuts are mission-critical and you probably don't want to take the risk. Lower-grade components may go "pop" just out of warranty, for example. So there are tiers - levels - of acceptable performance, assembly and component quality. Of course you aren't to know which tier you are buying at, although price is often - not always - a good indicator. For the unwary and uninitiated, many - perhaps most - PC manufacturers buy a great deal of proven hardware from somewhat 'hidden' suppliers, often extending to a re-branding exercise based on a "barebones" build. And that's a good thing. It maximises production runs and reduces costs. What you are buying and possibly paying extra for may be the same as another brand "under the hood", true; or it may be a premium version with the very latest build or higher-spec components. Or you may be getting a better standard of service and support. Or not. Comparison shopping is essential, and asking questions is key. Dig deep before buying. Just out of interest I wondered who actually made the 2016-spec "Kogan Atlas Pro" brand of laptops, for example, and with a bit of poking around I'm fairly certain (mostly based on a spooky resemblance in pictures) that they are Clevo barebones builds. And the spec is good. Technically perhaps a tad behind the absolutely cutting edge but performance-wise excellent and great value for money. 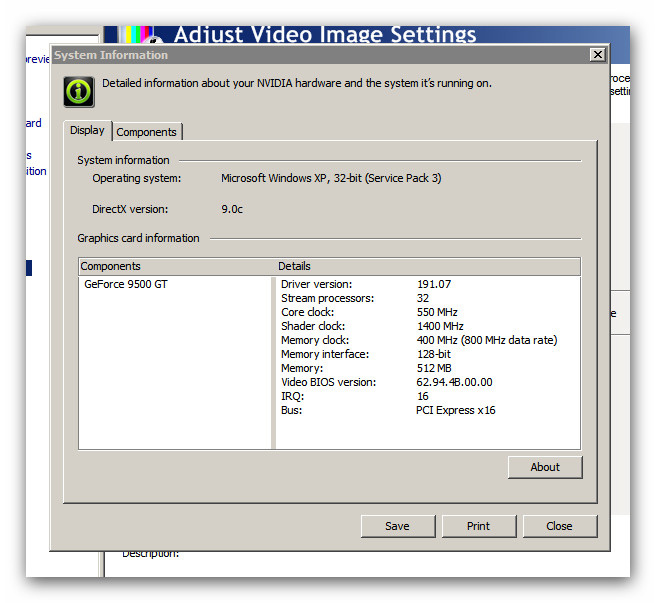 Of course this can change in the blink of an eye, with the simple up or downgrade of component levels. And whilst I have never had a bad experience with Kogan electronic products (a smartphone and a TV, both rebrands as well), my anecdotal experience is just one amongst many. Don't rely on one or even 2 opinions, after all. They (a re-branded like Kogan) may sell hundreds or even thousands. The happy customers rarely say so, but the unhappy ones can get out the loudhailer. The Clevo website is interesting, for those who like to explore these things... and for those with some technical nous who crave a little excitement as well as a bargain, check out RJ tech, who will supply you a barebones box (just add your own chips et al) or build it for you. Tempting, I know. Or just let someone else worry about it and buy a popular retail brand instead. Morph 2 images into 1 or an entire sequence. It even does layers. It's Fantamorph! Never click on links embedded in emails - at least unless you check 'em out first. Your email agent or virus software may flag it as a "scam" - or not - but be wary anyway. Just hover your mouse over any suspect link to disclose the real address that you are clicking through to... and if it looks unlike what you'd expect (just an IP address or a long and somewhat bizarre suddomain+domain address) then don't click. Most reputable businesses don't send out "click here if you think this is in error" messages anyway, so that's a clue worth noting. More than likely if it sounds like a fake transaction then it probably is. But if you do click through you'll simply expose yourself to nasty tricks and people that you really don't want to mess with. If you belive this is an error please follow the link below to login to your paypal account. On the next page, please complete the required details, then press the 'Cancel Payment' button to confirm. Your payment will be cancelled and the funds returned to your PayPal account. I have been receiving these e mails since I started using PayPal again to pay for items. They say it's a receipt for your payment but the amount & seller are not who you think. Then they give a link saying to click to cancel payment. DO NOT click the link, send the e mail to your spam folder & delete. The latest one I just got said I had paid $79.30 to AU-AdCommerce-EOM@ebay.com. If you think any e mail is suspicious just delete. Last Thursday at the Optical Fiber Communication Conference in Los Angeles, a team from IBM presented research on their wonderfully-named "Holey Optochip." The prototype chipset is the first parallel optical transceiver that is able to transfer one trillion bits (or one terabit) of information per second. To put that in perspective, IBM states that 500 high-def movies could be downloaded in one second at that speed, while the entire U.S. Library of Congress web archive could be downloaded in an hour. Check these other blogs out! Welcome to Windows. Hey, you'll get used to it. And don't imagine something similar doesn't occasionally happen in alternative operating systems like UNIX or the recent UNIX-derived Apple OS. Anyone who's worked on Apple hardware for example knows that whilst "closed shop" or proprietary designs can keep potentially clashing hardware and software designs under a tighter reign, when they do break it's often far less simple - and more expensive - to get to the root cause. And it's the very openness of the original "IBM compatible" and later Intel and Microsoft hardware/software partnership that both rewards us with plentiful alternatives at lower cost and delivers us into the looser, vaguer world of mismatched versions and uncontrolled design. But enough of that. How do you fix it? Well the BSOD usually gives you a clue. I just got one - and it blamed "NV4_disp.dll". You don't have to be Einstein to realise that "NV" is probably NVIDIA and "disp" is probably "display". It's your smoking gun, usually. 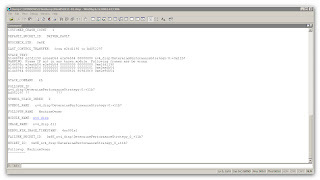 The "dll" bit is a Dynamic Link Library file, simply a file that provides one or more particular functions and/or some data for a given application. 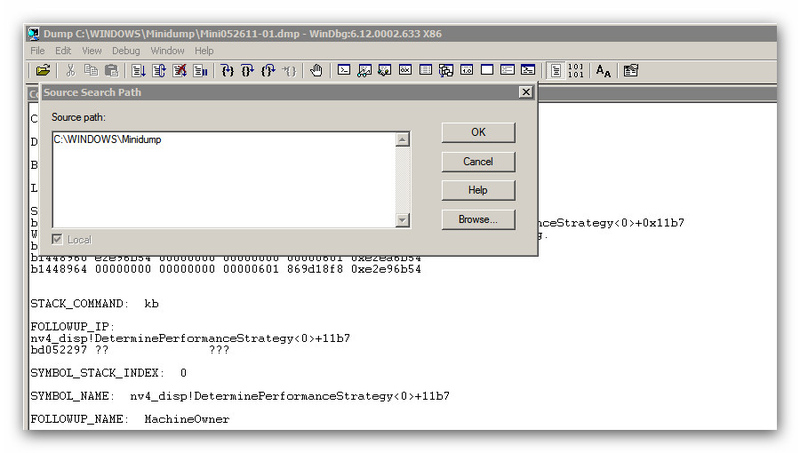 Generally speaking - and I'll use NV4_disp.dll as my example here - it's a device driver of some sort. So in this example NV4_disp.dll is happily driving the screen (or monitor or display if you like) and we call it the video driver because having many names for simple things is cool. Then you start up a new or recently updated video player (like I just updated Real because it asked me to) and it innocently makes a call upon NV4_disp.dll that just doesn't make complete sense. Perhaps your version of NV4_disp.dll is (like mine) 6 months old or more and is subtly different from "today's" standard. Somewhere along the road an error crops up that doesn't get handled properly and Windows itself steps in to save us all from disaster - by shutting down. Extreme, I know, but probably safer than letting things go from bad to worse. The best fix here is simply to update NV4_disp.dll. Whatever the BSOD identifies is usually the culprit, unless it simply can't work out what broke first. In which case you need to dig deeper (see the end of this story for more clues). 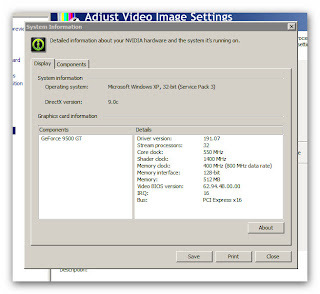 But how do you update a video driver? Or any other driver for that matter? Well the Internet can be your friend here - just search for say "NV4_disp.dll update" and choose the most likely - like the NVIDIA website. They have a tool there that searches automagically for the right driver. If that doesn't work (it didn't for me and my Windows XP SP3 machine) then go to your control panel and open the NVIDIA control panel. 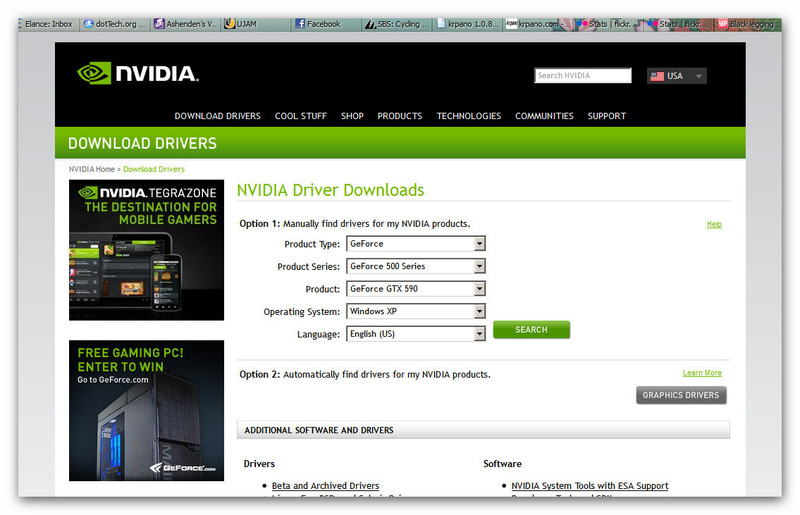 Look for "system information" and bingo, you have your driver data. 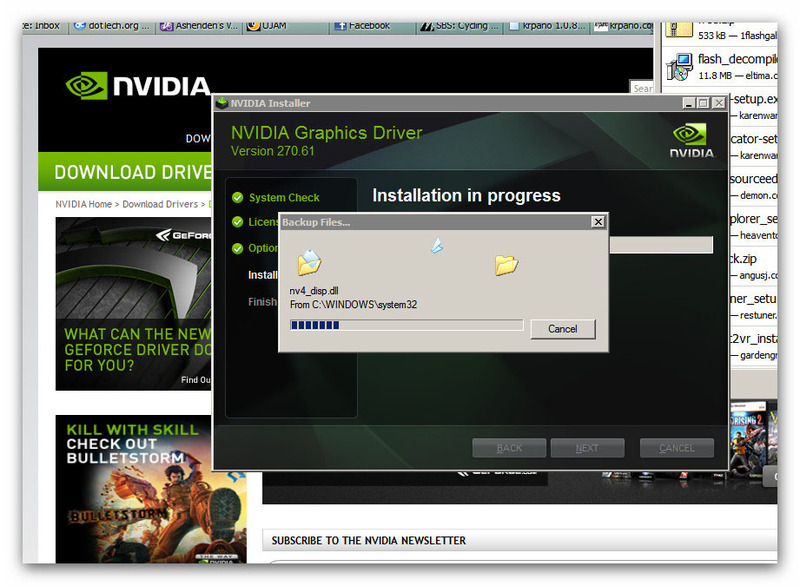 Plug that info in manually and it'll come up with the latest driver. Download and install that. Remember it's safer to download from the manufacturer directly, if you can. Run a virus check on the file just to be safe. But what if you need more clues, Sherlock? Well if the BSOD is clueless, try "WhoCrashed", a program by Resplendence.com that does the hard yards for you - and for free if you are a home user. (Search the Internet for it but remember to be careful who you download from and run a virus scan on the file.) 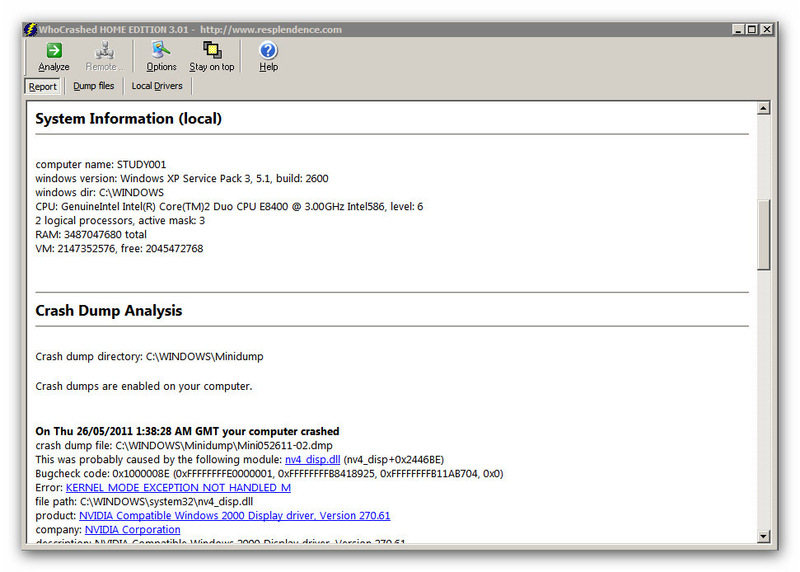 WhoCrashed may ask where your source files are - and these are your "minidump" files. 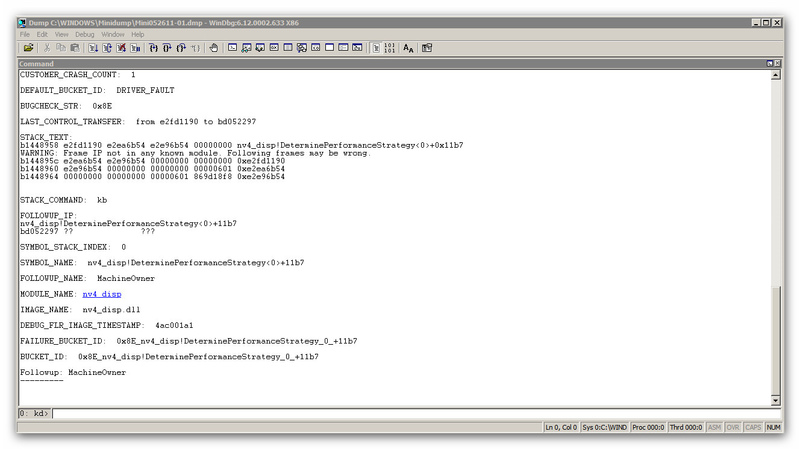 Minidump is simply a Windows repository for crash-logging files and is usually found under C:\WINDOWS\Minidump or similar. WhoCrashed will spit out a report. Read it, it will probably help to determine what, or perhaps who, actually crashed. If it identifies specific hardware or software then follow that trail with updates, reinstalls or rollbacks as needed. Search on the Internet for more opinons if you like, too. Often there are multiple solutions as well as countless false trails. 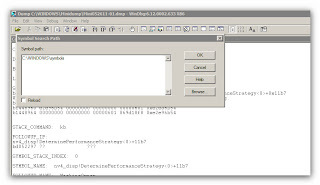 And if you prefer to use the genuine Microsoft debugger it's called WinDbg and it comes with the genuine Windows set of debugging tools, downloadable from the MSDN website (just search for it in the usual way). You'll also need the Symbols download or use the MS server like WhoCrashed does. Install it all (it's big but beautiful) and run WinDbg. 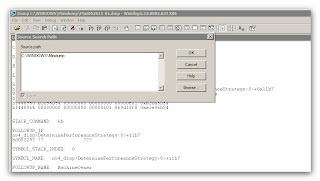 You'll need to set your source files folder to C:\WINDOWS\Minidump and your symbols folder to C:\WINDOWS\symbols (or wherever you put them). 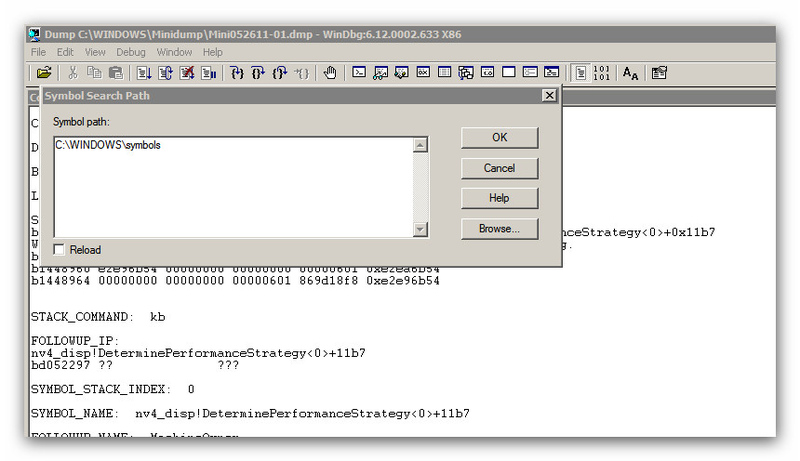 Then select "open crash dump" and the specific file you want - likely to be the most recent. When set up, click away and it'll open a report. Read it, I'll wait here. 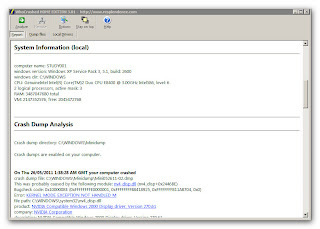 It'll probably suggest "Use !analyze -v to get detailed debugging information" somewhere down that report, so do that as well. Again, read the report and you'll usually get the gist of what the fault was. Usually. Take what action seems reasonable (ie fix, update, upgrade or throw it in the bin and buy a new machine). If any of the above sounds ludicrously complex then just don't do it. Take it to a shop - or (if you are on the Central Coast of NSW) call me - instead. Tweet me or use this enquiry form to get in touch now and ask a question. Ask me about my services, such as web and blog setup, photography, research and analysis, business strategy, music and audio software setup and how-to help at your place! Local Central Coast NSW PC help! Virtual Server hosting packages - check them out now! Template redesign by Rob Russell. Powered by Blogger.